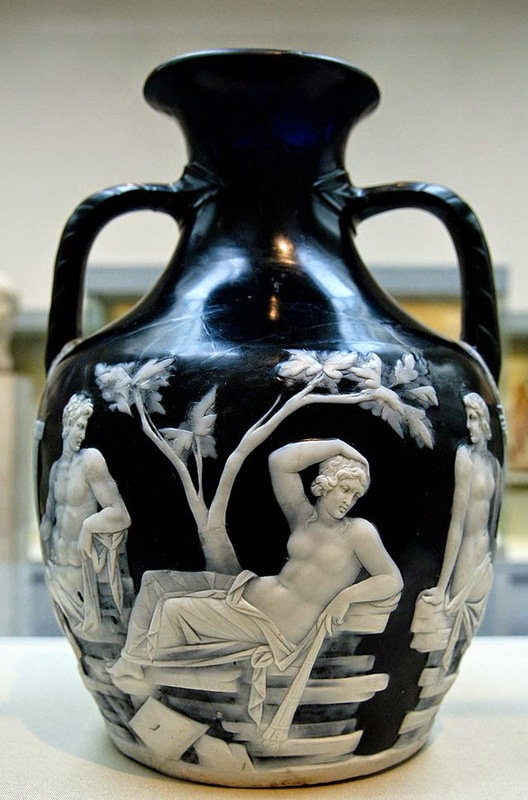 The Portland Vase, British Museum. 284 years ago this past weekend, (12 July 1730) marks the birth of Charles Darwin's grandfather, English potter Josiah Wedgewood. He founded the company that still bears his name, a name that has become synonymous with the iconic blue with white bas-relief cameo-themed jasperware pottery. What is less well known is that the style was developed over several years by Wedgewood in an attempt to copy a particular ancient glass object, now called the Portland Vase. This piece was and still is regarded by many as the pinnacle of ancient glass art. The vase was made around the time of the birth of Christ and shortly after the invention of glassblowing. A dark, cobalt blue vase was blown and then coated in a second thin layer of white glass. The piece was then carefully sculpted, probably by a gem carver, by grinding the white over-coat glass into various mythological scenes. The figures stand on dark blue ground that was revealed by completely grinding away areas of white, leaving only the under-layer. What is especially revered by aficionados, and gave Wedgewood the most trouble in replicating, is the delicate carving of the white glass. The figures depicted around the vase in various scenes are not monochromatic, but expertly shadowed just like a fine painting. This was achieved by grinding the white glass so thin that the dark blue under-layer starts to show through, making gradations of lighter and darker features. A face or a hand was shaded by making the white glass slightly thinner on shadowed areas. Wedgewood's solution was to subtlety tint the white clay he used, which was then applied to a blue clay vessel and fired in a kiln. One of his early successes, owned by Darwin, can be viewed at the Victoria and Albert Museum in London.